Here are three gifts to help your IBD. 1) Join the One Great Gut private Facebook support group where over 1,100 health seekers, Doctors, nutritionists, parents, friends and caregivers who have or know someone with Inflammatory Bowel Disease, Crohn’s or Colitis support each other on all things IBD. 2) After growing up with “stomach pain” throughout childhood, I was finally diagnosed with the Inflammatory Bowel Disease Ulcerative Colitis(proctitis, then pancolitis) in 2001. I used my background as a Scientific Engineer who thrives to solve problems using the most efficient and effective tools to apply towards my condition. In 2012 my health further declined, Medical Doctors often shrugged their shoulders not knowing how to help. I was forced to resign from my award winning Engineering job to take my Scientific Engineering skills to apply them to my health. I became an Integrative Nutritionist, Health Coach and spent the next few years diving deep into Scientific Journals, Studies, Case studies, the microbiome and anything that could help my IBD. I’m really excited to share my findings with you! I have many strategies that can help to put you on a path to feeling better and getting your Inflammatory Bowel Disease Crohn’s Colitis condition into remission! 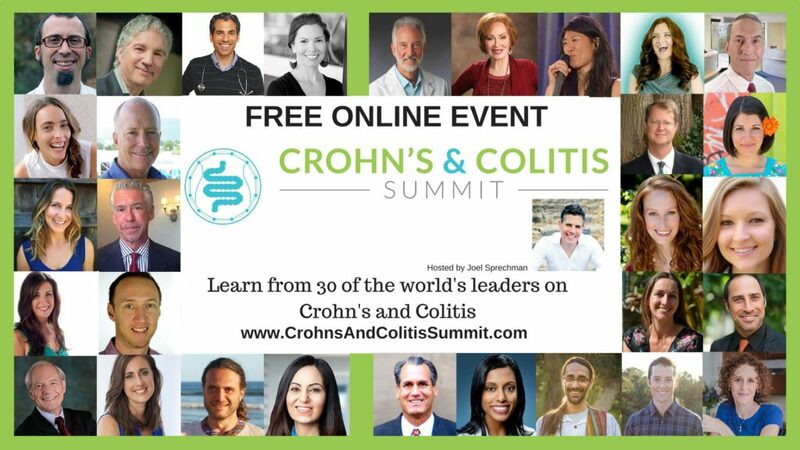 The Crohn’s And Colitis Summit is a free online event full of strategies, tips, resources and motivational inspiration to help you on your own health journey. It also includes Interviews with fifteen IBD patients who found long-term drug free remission. They share their stories, failures and successes. I collect the latest Crohn’s and Colitis news from around the world wide web so you don’t have to. The newspaper is free and includes the latest in scientific breakthroughs, Conventional and Alternative Natural treatments, research studies, clinical trials, case studies and patient breakthroughs. Sign up for free by clicking here.